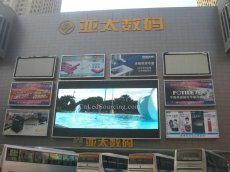 The affordable outdoor P10 SMD3535 3in1 advertising LED display billboard can create ultra-wide viewing angles, spectacular white balance and high contrast ratio besides the characteristics of traditional DIP panels. It is now becoming more and more popular not just for rental (mobile) but fixed installations such as airports, shopping malls, railway stations, plazas, stadiums, theme parks, schools, real estates, etc. The best price above is based on 1 sqm with top quality materials, FOB Shenzhen terms, and it does not include the control system such as Linsn, Novastar, Colorlight, Dbstar, etc. The production time with aging test is 22 days. - Brightness is adjustable manually or automatically against to light changing. - All programs can be digitally edited and played in a loop automatically on the timetable. - Can be controlled and monitored with camera at any time & anywhere via internet access. - Online detecting and fault informing is optional with monitored card.